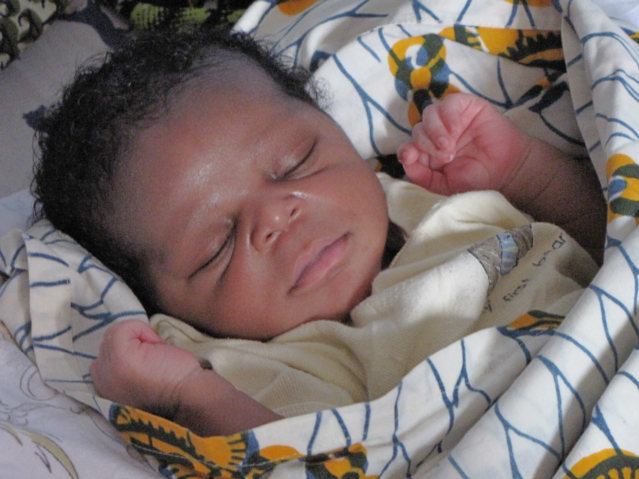 On Monday February 24, 2011, a baby boy was born in Grand Bassam to a special friend of mine here in Cote d’Ivoire a.k.a. Ivory Coast. The mother work is to sell prepaid credit for cell phones, you walk up to her, tell here you telephone number, and she transfers airtime onto your portable phone, this is her business. I was excited; one of the local boys instantly stood up and escorted me to the new mother’s apartment. Upon approaching the entrance, I took off my sandals, walked in quietly, first, I check with Benedict, are you ok, are you fine, is everything good? Hmm, she is from Ghana, part of the Nzema language or tribal group that lives here. Therefore her first language is Nzema; her second is English and third is French. As best I can discern, approximately 50-80 percent of this immediate neighborhood are semi-immigrants from Ghana. When I ask questions about Ethnic backgrounds, country of origin, languages spoke and general family history I seldom, if ever receive an honest and direct answer. If you accept statement, than you can understand that a census is not an accurate report, it is just a guide. I needed to become an insider, I needed to be one of them, before I was afforded specific knowledge, and they needed to feel safe with me before being honest. 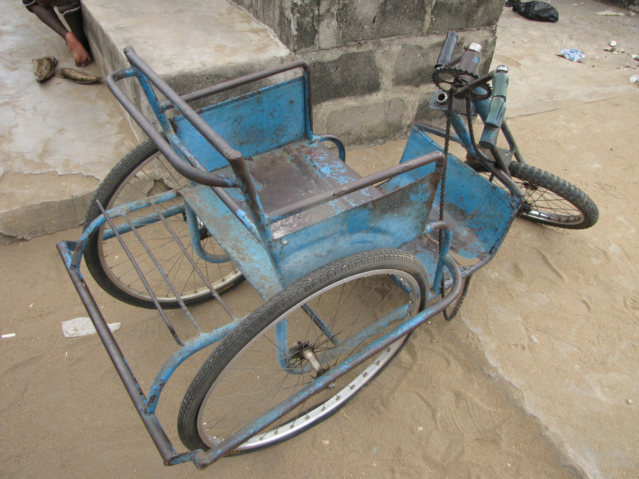 I took this photo on the same day while standing at another huddle of locals; I was shaking hands with the owner of this bicycle wheelchair, when I realized the chain was off. Looking closer I realized he had a flat tire; eventually I put two and two together. He was waiting for a taxi so he could take the one bicycle tire to be repaired. I had pangs of empathy, to become immobile and dependent on others for help is emotionally painful, you are never equal, your social status is always less than your friends. When I was 23, I broke my femur, the large leg bone in four places in a motorcycle accident. I was in traction in the Bloomington, Indiana Hospital for seven weeks. Then proceeded to walk around on my armpits for another 11-12 months. I say armpits, because this is where majority of the weight of crutches lands. I had a wheelchair, I had crutches, I was disabled for a couple of years of my life, people avoided me because I was half OK, I had special needs. In a fit of empathy, I started to offer to help, than I stopped, he did not ask for help. There is no act of kindness as debilitating and harmful as telling another human they are not equal by actions. I never walk up and just offer money to a beggar, I do not make beggars, they do that to themselves, I do not rob people of dignity. Therefore, to treat the man as an equal, I shook his hand, gave him a nod of my head, and went along my way. Quite by accident, we were in the same taxi returning, he hopped in back as does a man with no legs, he had with him a freshly repaired tire. I was in the front seat of the collective taxi. I had just purchase four frozen citron bags, an ice treat; I took one, held over my shoulder and offered. I did not look back because he is a friend, he took the bag, said "Merci," and we met as friends again as equals. Truly my mother somewhere down the line has been working for years, I know what she wants, she wants me to overlook small differences in other people, to look the other way, I am learning. I am not sure it is possible to volunteer to be a good person, maybe we are called upon to be a good person, and we must be ready when opportunity to prove our worth arrives. Proofreading that sentence, I learned an insight about myself; it is possible I consider people worthless who refuse to do good deeds freely without thought. Often people want the acclaim of others, to be celebrated as a good person, this is how they are paid, and it was not done free. There are places on the planet, where everybody knows my name. I want to say Khao San Road, Thailand, but this is not true, there is no family of man there, I am just very familiar with the area. In many ways, I am a returning regular guest at the Platypus Hostel in Bogota, Colombia, but not a home away from home, it is a retreat of mine, and I know the owners and staff. Home is a place where somebody will protect you from harm. Does someone have your back, where you live? If you fell down, would someone pick you up without wanting money? Expatriates are often loners, refusing to accept long-term friendships, and searching for places where they can buy friends. Volunteers and Missionaries want to arrange to have a group, organization or someone to protect them when they arrive, then need someone to pick them up at the airport. Couchsurfing.com allows people to arrange friendships prior to arrival, with the hope by the surfing person that he or she is going to live in a home away from home. I am guessing, but only about 1 in 500 people travels alone, by traveling with another person they have a mobile home away from home, there is somebody to pick up the pieces when things break. I always know my exit strategy, I know how to escape dangerous places, I am the 1 in 500, and I know where my homes are located on planet earth. I probably and naturally came back to a place where people protect me, if the situation was really bad, I would return to Orland, Indiana to feel the best protection. I think about marriage, and its value, this social contract is an agreement to love and protect. To function properly, we need to know our spouse is capable, and willing to protect us from harm. Many strong people and organizations spend all their time trying to protect small people from harm, then one day they have a problem, and nobody comes to their assistance. When I have a friend, I often ask myself, will this person stand up for me, or run and avoid me in times of trouble? There is a false sense of love felt by helping others, often a person is delusional, they are happy, they feel loved, because they gave love, this is fools love, it is not love, love is a two way street. Home must be a place where everyone knows my name, when I fall down, someone is there to pick up the pieces. Where even a person that spend 99 percent of their time taking care of others, has the loyalty of friends to help when not paid. Mom, I remembered to buy a gift for the mother of the baby; I kept my head about me, when everything around me is confused. Andy's Mom- Please tell Benedict that I am so happy for her. She has a beautifull baby. Do not know if it is a boy or girl but that does not matter because it is a wonderfull gift to care for and love all of her life. "Are you somehow intentionally letting your guard down as some sort of experiment perhaps?" This is not an experiment, this is my real life, and not so wonderful today. I have never married, I am 55, again back to the obvious theory. I am obviously afraid of something involving love or commitments. My own fears distort my ability to make good decisions with women, therefore it become more difficult to know when I am making a good or a bad decision, i am positive in love relationships I can imagine things that are not real, and make horrilbe decisions. I am trying to weigh Bah by her actions, however the culture is incredibly harsh, blunt and brutal, they are natural at being bullies. There is a path of least resistance, and that is outside of Africa, but maybe the path here will give me the most reward with the most amount of work. I feel safe in Quartier Grand Bassam, the people are my friends, although I am quite sure this country is still moving towards a civil war. This may sound dramatic, however today I am very alive, my brain is clear, my nerves are working, I am awake and aware of me and my feelings. Unfortunately, I needed to enter into a rather dysfunctional relationship with a girls, and go live in a country at war to be awaken, nonetheless, I am awake. I am writing this book, it is about finding sweet spots on the planet, place where we feel at home, where we are safe, and where the cost of living is so cheap, that even the most negligent person with a budget is OK. I am setting a budget of 500, and when a person spend three times that, they will still not be impoverished. When under the greatest challenges a person must use all their skills to find the proper balance. What I am trying to say, I am greatly challenged here in Ivory Coast and it would be a good time to have a clear thought and finish this book. I am looking now for a two month window, not sure where it is, but give me a two month window and I will close the window and close the book, I will finish it. I know out of mass confusion I can pull a clear thought. Part of my 'program' is to help someone less fortunate than I each day, when possible, often on the city bus home, there are kids and adults both selling candy, a fistful of candy for 25 cents US, sometimes I will buy the candy and give it to a child on the bus, with permission of Mother or Adult Guardian with them, none have told me 'no' and the child lights up like a Christmas Tree, among my first memories were being in a 'baby seat' in a 1950 Ford, built like a tank, with overdrive, driven around by my Mom or Dad, I never had to ride a 20 year old Blue bird school bus on my Mother's lap, I was fortunate. Andy, know if you get caught up with anything over in Cote D'Ivoire (love French, mine is rusty, we had the Cote de Niege in Montreal, road icy and dangerous in winter) you will instinctivly know waht to do, when and survive. G-d takes care of drunks and ex drunks, children, crazy people, older persons and the USA(or citizens thereof abroad), I now fit into 4 catagories, Salut. Nice article on the baby. Au revoir.